Instruments Taught: Trombone (beginning through advanced), Piano (beginning through advanced), Trumpet (beginning and intermediate), Baritone & Tuba (beginning through advanced), Guitar (beginning and intermediate), Bass (beginning and intermediate). Musical Influences: Christian Lindberg (Trombone), Claudio Abbado (Conductor), Maurizio Pollini (Piano), The Beatles, Michael Brecker (Jazz Saxophone), Tom Petty, The Beach Boys, Nobuo Uematsu (Japanese Video Game music). Education: Bachelor of Arts in Music from California State University, East Bay. Musical Projects: Current member of the UC Berkeley Symphony Orchestra (USO), Lost Dog Found (Swing Band), Marin Symphony, Silicon Valley Symphony, Prometheus Symphony (Oakland), Gustavo Dudamel (Conductor LA Philharmonic), Esa-Pekka Salonen (Conductor), Dr. Brian Bowman, The 9 O’Clock Lab Band (UNT). Books/Methods Used: Arban’s Method for Trombone, Rochut Melodic Etudes, Kopprasch Etudes, Alfred’s Basic Piano Library, Alfred’s Guitar Method. Key Teaching Concepts: A solid foundation of fundamentals as the key to excellent musicianship, encouragement as the path to success. 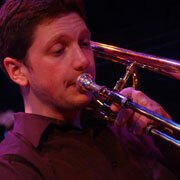 Kevin Harper is yet another talented and well-educated multi-instrumentalist instructor on staff at Music Time Academy. Although his primary instruments are Trombone and other members of the low brass family (Trumpet, Baritone/Euphonium, Tuba), Kevin has extensive teaching experience as both a piano and guitar instructor, and has been well-received by many students of all ages, regardless of instrument. His patient and positive attitude has made him a popular choice for beginners especially, as well as advanced students looking to take their musical skills to the next level. “If at first you don’t succeed, keep trying until you get it right. Then it will become easier,” says Kevin. With an impressive foundation in music education, Kevin holds a Bachelor’s Degree in Music from California State University, East Bay and has also attended the Boston University Tanglewood Institute (BUTI). As a private student, he has studied Trombone extensively under Dave Ridge (SF Opera), Tom Hornig (Oakland East Bay Symphony), Jeff Budin (SF Ballet), Abbey Conant (Munich Philharmonic), Tony Baker (Dallas Opera), Jan & Vern Kagarice (National Philharmonic). His education is supplemented by equally impressive performance credentials, including local gigs with a vast array of musical ensembles ranging from the University of California Symphony Orchestra and the Marin Symphony to esteemed swing/party band Lost Dog Found. Kevin has also made many appearances at the Reno Jazz Festival.